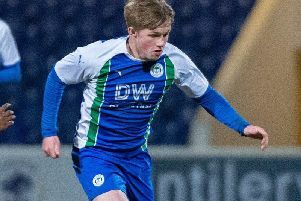 Sanmi Odelusi made a welcome return for Wigan Athletic’s Development Squad yesterday – with boss Gary Caldwell insisting the best is yet to come from the forward. Odelusi has struggled to make much of an impression in his debut season at the DW Stadium, following his summer arrival from Bolton. He made only five appearances before sustaining a serious foot injury, which he then aggravated after returning to training in February. Odelusi was originally ruled out for the campaign, but his recovery has been so swift that he was able to play the first half-hour of the Development Squad’s 2-2 draw with Bradford at Christopher Park. And the watching Caldwell was delighted to welcome the 22-year-old back in the fold. “Sanmi’s not trained much but, because of the timing of the game, it was a good opportunity,” Caldwell told the Evening Post. “He’s looked fantastic in training and we wanted to get him over the hurdle of getting him out there playing as quickly as possible. “I spoke to him on Monday and asked whether he fancied playing, and he was up for it. “He got 30 minutes under his belt, just like Michael (Jacobs) did last week, and hopefully that will help him to continue his recovery. “He’s somebody that I don’t think we’ve seen the best of. Kevin McNaughton also got valuable game-time under his belt, although the majority of the team was made up of junior players. “We put out a young team, which is good to give them the opportunity to play against a strong Bradford side,” added Caldwell. James Barrigan and Sam Cosgrove were on the mark. Meanwhile, Wigan’s trip to Burton on Tuesday, April 19 will be beamed back to the DW.